The underside of the Vine Street powerhouse as seen from the Third Avenue bridge today. Albany Hydro, the 500-kw generator powered by water from the Santiam Canal, is back in business. It started up Friday when the flow in the canal was sufficient once again. 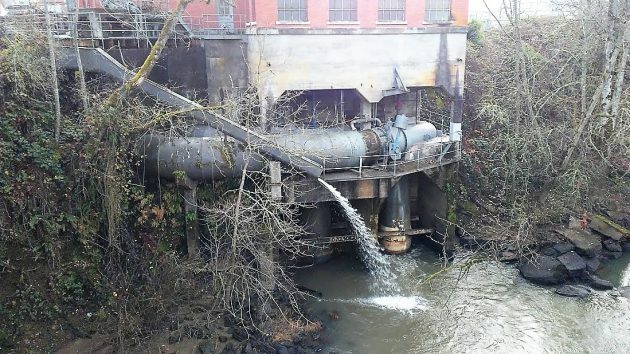 The generator is always shut down in the summer because Albany’s federal power license does not allow it to be run when the South Santiam River near Lebanon drops to 1,100 cubic feet per second or below. This year, river conditions would have allowed generation it to be restarted in early September, but it wasn’t. The flow had to be kept low while the city of Lebanon bored under the canal as part of its construction of a new water intake on the Santiam. I went to take a look today. Sure enough, the turbine shaft was spinning and tons of water gushed from the turbine’s outfall into the Calapooia River. Years ago, somebody kindly daubed some red paint on the shaft so you can see whether it’s going around when you stand on the Third Avenue Bridge to Bryant Park. That’s as close as you can get unless you want to wade in the river. Nice update HH. Thank you. And good news. Too bad the power generation is sold to a corporate entity and not used directly say to keep the lights on during council meetings and such local government functions. But does is the cost of running and maintaining the generator covered by the income it earns? Good question. Worth a look. A steam plant consumes fuel, requires emission control equipment, requires sophisticated support equipment to prevent catastrophic failure. This little guy doesn’t require nearly as much care and feeding. this little guy requires all kinds of work on a canal, screens, and paperwork galore…. it has not paid it’s way, the real question is now that we have it, how do we make it pay….. When you find yourself digging a never-ending hole, perhaps it is time to admit defeat and back away. Let the Private Sector skim the cream. Nevertheless, these things always come down to the money. If the Albany Hydropower business breaks even, the operation is probably a good thing because the water flows whether or not humans tap into the energy. May as well use it. If the Albany Hydropower business is a money-losing operation, sell it off to a for-profit company. At minimum, those folks can use the new gift to Corporate America (not-so-cleverly disguised as the GOP tax cut for the rich) and write-off the hydro-losses against more profitable ventures….a kind of corporate welfare, one could say. Under the new GOP tax scheme, a for-profit company could purchase Albany Hydro and then get the 100% depletion tax break immediately. Perhaps someone in Albany could be thoughtful enough to comprehend the possibilities. We are ready to consult with you on the myriad options available. One of the issues of concern to the Council when the project was funded was water rights, and backup to the new water plant. The non-use of the water rights for hydro-production could have caused the city to lose that water right. The “back-up” use of the water treatment processing in the event of problems with the new plant would have required ongoing maintenance of the canal. Even just maintaining flow in the canal for historic/amenity uses would have required operating and maintenance costs of the canal at some level of expense. All those reasons, plus a generous grant from the Energy Trust, all figured into the decision to move forward. Once the project commenced, serious problems arose over the structural failings of parts of the historic plant that had been unknown and had to be fixed. It should also be remembered that a succession of private entities, culminating in Pacific Power, ran the plant for many decades and did not appropriately maintain it, because the only thing they measured was the bottom line on a balance sheet. The installation of fish screens at the canal intake at the Santiam helped to maintain fisheries in the Santiam. Albany has saved a historic structure of note that was once a significant link for a young city. Go in some time and let your children see the heritage of their forebearers from a century ago. Not every decision in life should only be quantified by the current rate of return. Well put Bob! Plus this is green energy. If you calculate the long term real costs of energy, it generates much more than the value on the books. Thanks for bringing that piece forward. There had to be a constructive use to protect the water right. The generator fills that need and provides a modest positive cash flow. Thanks Bob for your excellent explanation of our canal, water plant and power plant.